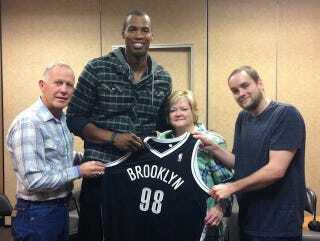 After last night's 112-89 victory over the Nuggets in Denver, Jason Collins met briefly with the family of Matthew Shepard, the 21-year-old from Casper, Wyo., who was tortured and murdered for being gay in 1998. Collins presented his signed N0. 98 jersey, which he wears as a tribute to Shepard, to Shepard's parents. "It was great," said Judy Shepard, who had spoken with Collins by phone last year after Collins announced he was gay and wore No. 98 because of her son. "It was all great. He's very kind, smart, humble. It was delightful. We were happy to finally have the opportunity to meet. Denis Shepard said after the meeting that he hopes the day quickly comes when someone's sexuality is a non-issue. "There should be no publicity over this. It should be just an ordinary, everyday thing, like the military now," he said. "That's what we're hoping for, soon. Thank you very much." Collins tweeted out the photo above last night, adding that he felt fortunate to have met the Shepard family.